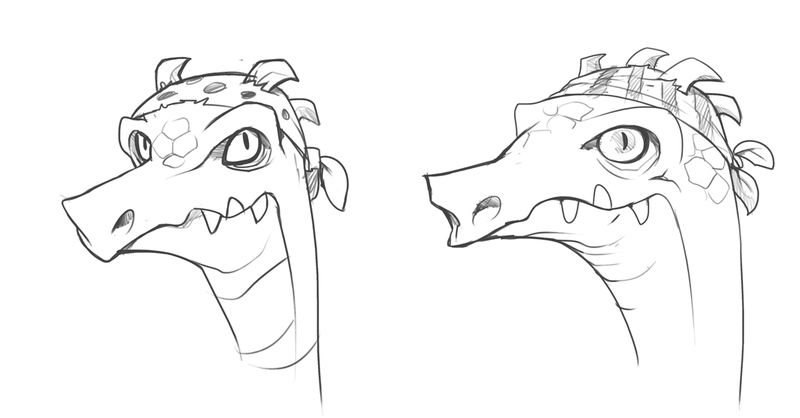 Some early versions of Wrench’s head. Today we are excited to share more images from the most unique Red Dragon Inn character yet: Wrench. One of the most exciting and time consuming parts of creating characters for The Red Dragon Inn is establishing how they look and are animated through their card portraits. The fun of the game depends heavily on players getting to know their characters, so we spend a lot of time working with artists to create evocative and fun character designs. Wrench is no different, especially as one of our handful of monstrous player characters! That’s why we’ve enlisted the aid of a fantastic illustrator, Anthony Cournoyer, to make Wrench a reality. One of the important aspects to his character is how he is a perfect example of an unlikely adventurer. He does not possess great fortitude or endless bravery, and relies heavily on his gadgets and traps to see him through dangerous situations. We wanted to ensure that Wrench himself gave off an awkward, skittish feeling. After-all, he’s a kobold, and that makes him typically one of the smallest things running around in the dungeon! However, we couldn’t forget that he is a professional, and a constant surprise for his companions. One of the earliest test pieces working on his general body shape and posture. We went through multiple iterations of his character. 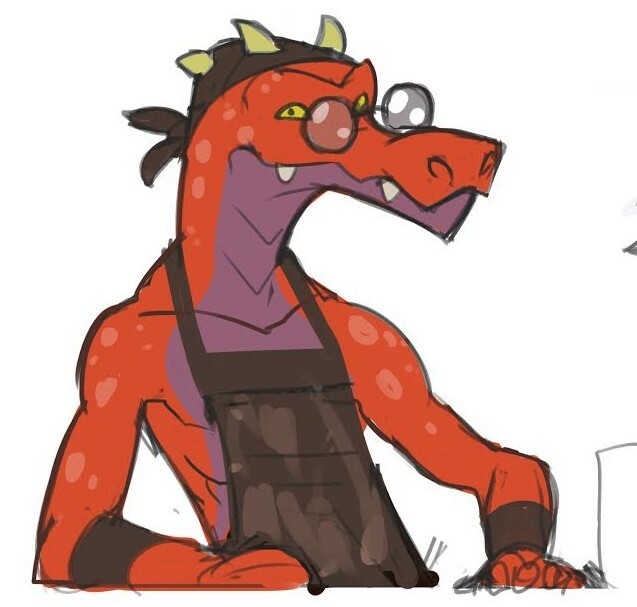 From angular and aggressive looking modern DnD Kobolds to the more cartoony versions that would be welcome in a Don Bluth film. We wanted to do many iterations, so we could grab the pieces that would make him as expressive as we needed for his character portraits. Card titles would let you hear his voice, but his look needed to match. Color test establishing his basic color pallet. In contrast to Wrench’s skittish attitude, his gizmos were designed to be fearless. They are clever, and intimidating, but also had to have a cobbled together feel. We wanted them to have a bit of a “Macgyvered” feel to them, to show off just how competent a tinkerer Wrench was. He rarely has the correct parts for a given contraption, but he can definitely jury rig just about anything into the right part for the job – at least for a little while. 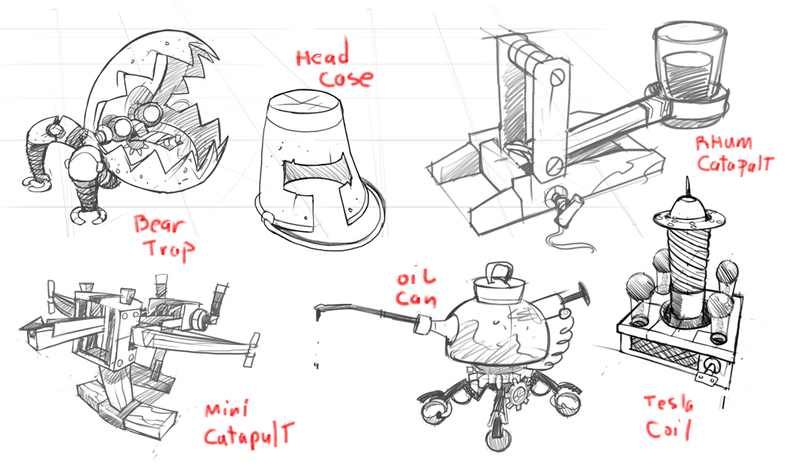 First drafts of just a few of his gizmos. Of course the only way for Wrench and his Gizmos can join the party is if we put them in the tavern! Beth Trott has been one of our illustrators since we started publishing games, and is the artist responsible for the backgrounds in The Red Dragon Inn (as well as the Crimson Drake). 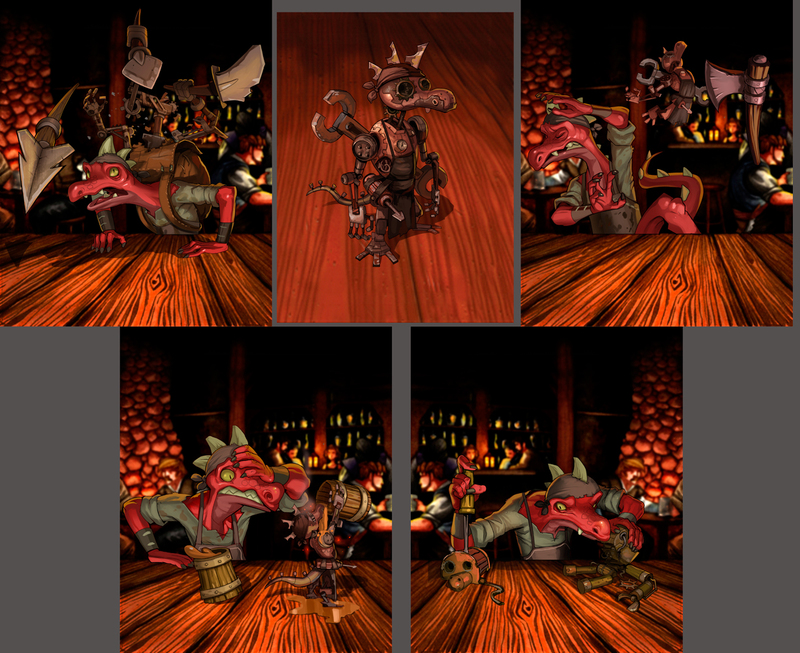 To make sure that each character joins the party with the rest of our characters, we make sure to template and fit each illustration to the background lighting as well as the all important oak table. Because of Wrench’s Gizmos, there is usually a lot going on in-frame! Wrench is currently only available to the most active of our SlugCrew Members. If you want to get your hands on his character deck you’ll have to sign up for SlugCrew and run demos or wait until 2015 when he will receive an official release. A handful of finished compositions!